What a fun day, for me and the rest of the family, but especially for Joey as he celebrated his 8th birthday! 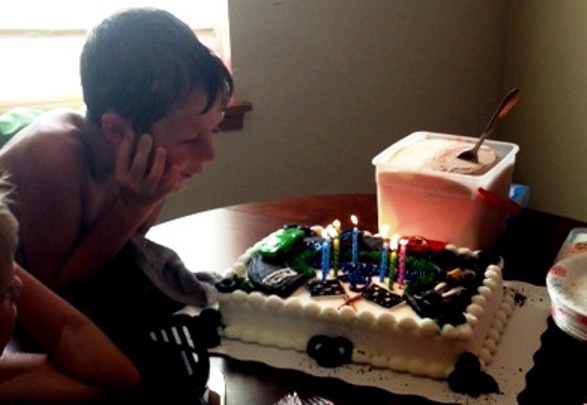 This sweet, thoughtful young man actually turned 8 last Sunday. Today, however, was the day the family gathered to take part in a full afternoon and evening of festivities. Joey is the son of my son’s fiancé, so he is welcomed as a new grandson. For me, he is already my grandson, and I am his Yaya. Nate and Megan went all out to create a special day for Joey, making sure they included some of his favorite activities. The afternoon began with Joey, Oliver, Aubrey and several cousins attending Mudstock in Carthage. Sponsored by the Carthage Fire Department, the event is described as a mix of dirt, water, an obstacle course of rope swings, mud pits and hills, low rope obstacles, sun and fun. The kids are allowed, and encouraged, to get muddy as they play and move through the obstacle courses. What a great idea and fun activity for kids! After cleaning up, the party began at Nate and Megan’s house. Joey wanted a water themed birthday party. Adults chatted and watched as kids swam, ran and slid down a slip n slide and threw water balloons. There were kids everywhere, mostly boys, as all of Joey’s cousins are boys except for London! 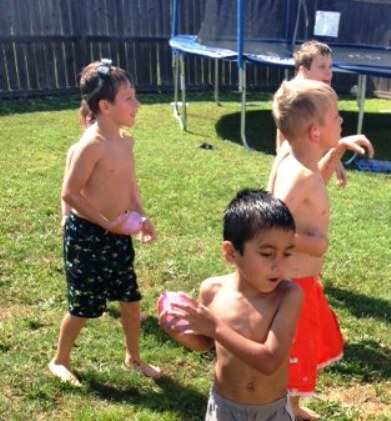 It was a hot June day, so the water felt great to the kids and to the adults who were splattered with a water filled balloon. I didn’t mind one bit when the water balloon I was tying off for Oliver suddenly slipped from my fingers and sprayed me with water. 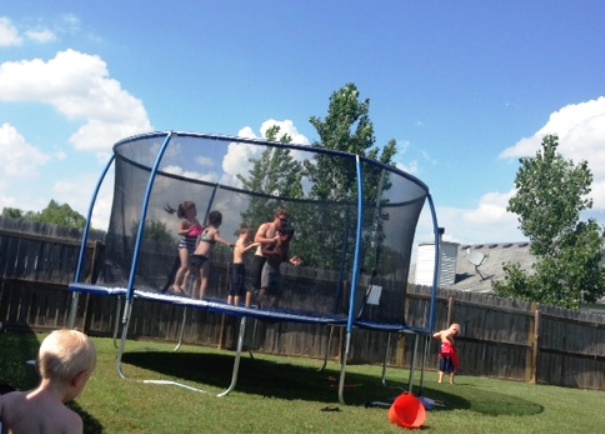 The kids enjoyed bouncing on the new trampoline as well and discovered that the water balloons didn’t break immediately when dropped onto the trampoline’s surface. Instead, the balloons bounced and jiggled along with the kids. After cake and ice cream, opening presents, and a bit more play time, the party shifted to a Sonic in Joplin that has a sand volleyball court and play area for kids. Joey likes to play volleyball and yet the court was always busy when he tried to join in a game there. His great parents solved that dilemma by renting the court for the evening. 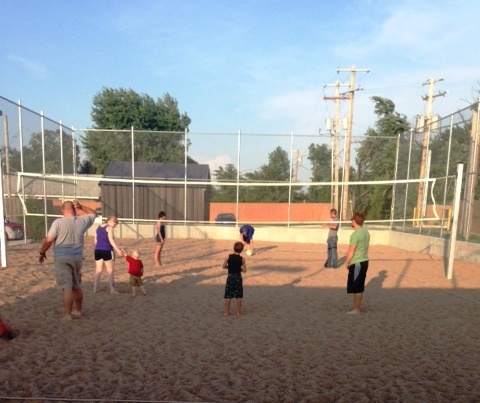 Joey got to join cousins and adults in his family in fun games of volleyball. I watched from the sidelines and he did great going after the ball and serving it up. What an amazing day, for an amazing boy. I am enjoying getting to know my grandson. He currently likes the color orange. As the older brother, he watches out for his new younger sister Aubrey and his brother Oliver. He and Aubrey have been known to join forces in plotting out adventures. He enjoys art and has an interest in and talent for drawing. He loves animals, RC cars, and nerf guns. He’s a thinker, quick to show affection and say “I love you” and kind hearted. I look forward to watching him have fun, grow and become the person he is meant to be. He has family who loves him very much and will be there to journey alongside him as he figures out who he is and what he is here to do. Happy, happy birthday, Joey! I love you!